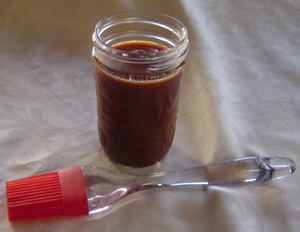 My favorite homemade barbeque sauce! Once you've tried homemade barbeque sauce recipes, you'll never go back to store-bought! This is the only barbeque sauce I use. It's quick and easy to make, it tastes wonderful, and of course it's more economical and healthier than bottled sauces. I use this on beef, on chicken, on pork, and in bean dishes. Stored in the fridge, this sauce will keep for about 2 weeks. Put all ingredients into the blender container. Transfer the sauce to a saucepan. Simmer, uncovered, for 10-15 minutes, or until a bit thickened. Use another type of vinegar instead of cider vinegar. Use maple syrup or honey instead of molasses. Add your own choice of spices. How about oregano instead of thyme? Or some dried mustard? Cayenne? Paprika? Spice up your sauce by adding some Worcestershire sauce, or a bit of hot sauce, or some minced chili peppers or red pepper flakes. Use a spatula to scrape every drop of this tasty sauce from the blender container. Molasses is messy! I store the molasses container on top of a pie plate in the cupboard. It always drips. Return from barbeque sauce recipes to blender recipes.